As I've said many times before, poultry is hands-down my favorite thing to grill and barbecue, especially chicken. I'm always looking for new ways to explore fire-roasted yard bird. This time out I go south of the border, Daddio-style. 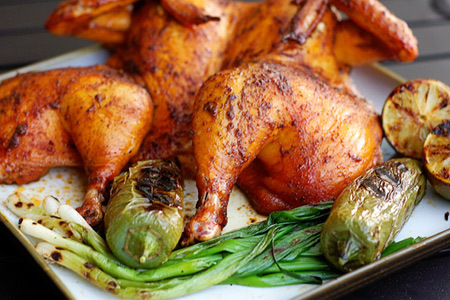 This recipe is perfect for summer outdoor entertaining. It's simple, but the result is a beautiful and somewhat mysterious (in a good way) blend of light citrus and spices that is a welcome departure from your typical grilled chicken. You can serve it cut into pieces on the bone or shred it for some killer chicken tacos. 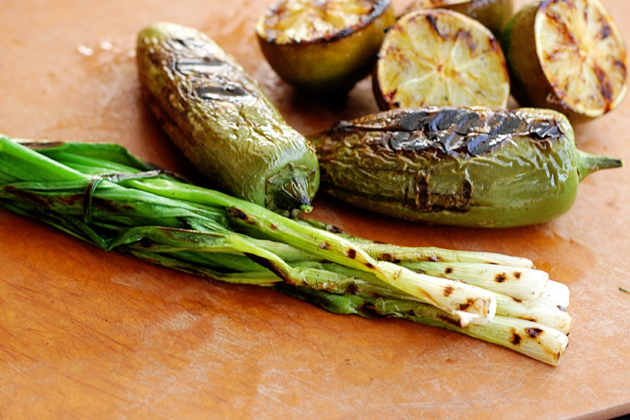 It's traditionally served with grilled green onions, and I threw in some fire-roasted jalapenos and limes. Put the chicken in a gallon zip-top bag and add the Sunny D® and salt. Seal the bag while removing the excess air. Slosh the bag gently to combine. Put the bag in a lipped baking dish or sheet pan (to catch any leaks) and refrigerate six hours, or preferably overnight. About 90 minutes before you want to serve, start your grill and prepare for indirect cooking over medium heat (300-350º). While the grill is starting, make the wet rub. Combine the allspice berries, oregano, cumin seeds, and peppercorns in a spice grinder, grind fine, and pour into a small mixing bowl. Add the remaining wet rub ingredients to the bowl, whisk/stir well to combine, set aside. 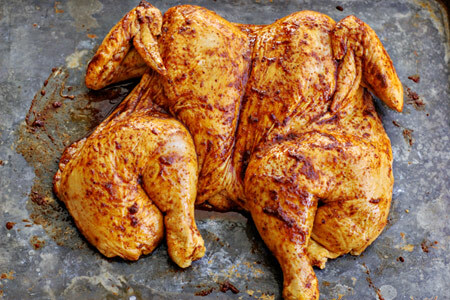 Remove the chicken from the marinade, rinse well with cold water, and pat dry with paper towels. Smear the entire outside of the chicken on both sides with the wet rub. 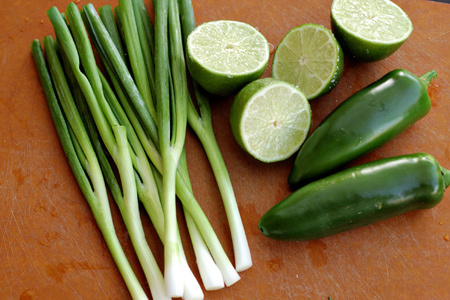 Clean and dry the onions, jalapenos and limes. Trim the ends of the onions. Halve the limes and sprinkle the cut sides with sugar. Grill the chicken indirect until the internal temperature in the thickest part of the thigh reaches 165º (about 60-75 minutes). Just before the chicken is done grill the onions, limes and jalapenos on the direct heat side of the grill until each is nicely roasted, set aside. 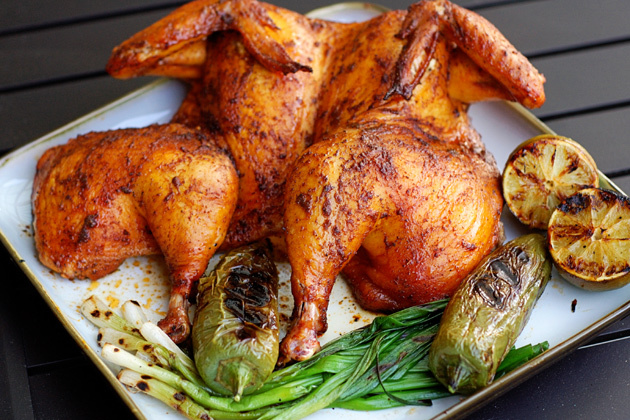 When the chicken reaches 165º in the thigh, remove it from the grill, let rest five minutes, and serve with the onions, limes, and jalapenos on the side. Oh me, oh my - looks amazing! The idea for the tacos has me drooling, dude. I finally got your "gun" and I'm shipping it out in the morning. Enjoy! Thanks, Chris! I'm looking forward to peppering some bugs with some salt. ;-) Thanks for the hook-up. John- this recipe looks freaking awesome! I can't wait to try!! I'm a sucker fora spatchcocked chicken! Robyn - Thanks, girlie! Gitcha some! jeh - Let me know what you think. 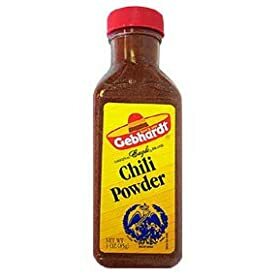 This looks fantastic...been looking for a new marinade for chicken and love to grill peppers. Thanks! I bet those ingredients pack a lot of flavor into the chicken. Looks outstanding. Amazing flavor. Glad I did two birds cause the leftovers are gonna find their way into tons of stuff this week. Really good. Thanks, Braden! I'm really glad that you enjoyed it.